I posted back in November about the monthly Take and Make projects that we offer at the library. This is a passive program in which we leave a Ziplock bag with instructions and supplies out for grown-ups to take home and make with their children. This is just another way for us to offer early learning experiences for grown-ups and children without having to add another official program to our already busy schedule. The Take and Make projects have been very well received by library customers, though some projects are more popular than others. Our most popular Take and Make so far was December’s Easy Knit Scarves. I prepped the loom by taping Popsicle sticks to a toilet paper tube. I did not provide the yarn, but I did provide instructions on how children should weave and loop the yarn around the Popsicle sticks to make a scarf. 50 of these projects flew off of the shelf within two weeks! We probably could have easily surpassed 100 with this project; however, we ran out of toilet paper tubes after the first 50. So once they were gone, we moved on to something else. If you’d like to offer Take and Make at your library, just throw some supplies into a bag (this could be a good way to get rid of left over crafts from various programs! ), add an instruction sheet, and place them in an area where parents will find them. At my library, we are always trying to find new and fun ways for grown-ups to have meaningful interactions with their children. In addition to storytime and a wide variety of programs, we also offer passive activities that grown-ups and children can explore together. For the past couple of months, I’ve been creating Take and Make bags for families to bring home and work on together. Each month is a new activity. Last month we did nature orbs (credit for this idea can be found here). 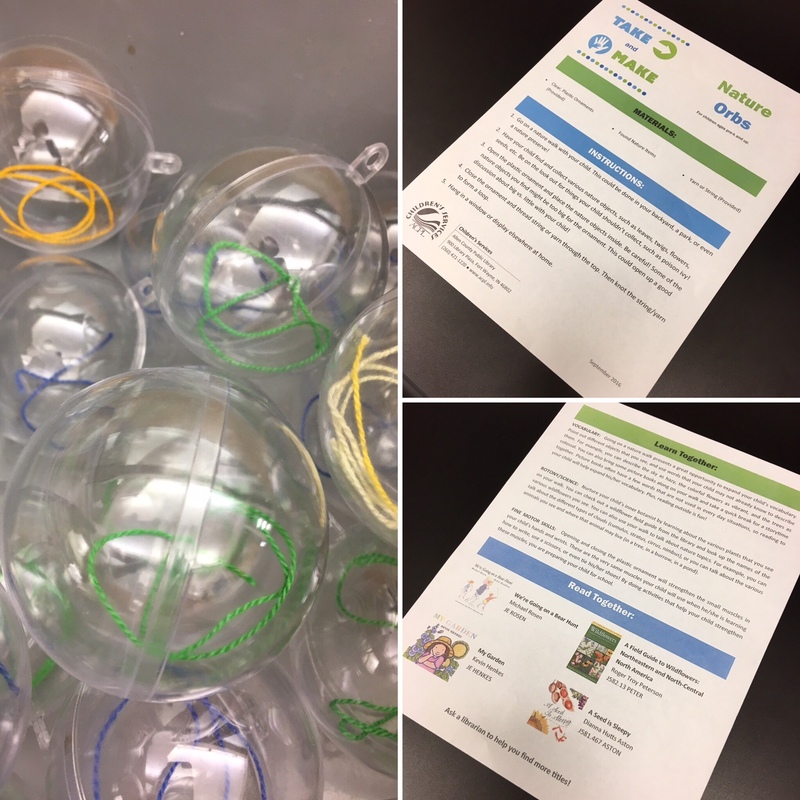 I provided clear, plastic ornaments and some string, and I instructed grown-ups to go on a nature walk with their children, collect various bits of nature, and to place the nature items in the ornament and hang it up at home. This particular project was such a huge hit, that I needed to buy extra ornaments just to keep up with demand! Other Take and Make projects that we’ve done include crystal suncatchers and thaumatropes! To make Take and Make bags, I simply place the project’s materials and a learning page into a clear, gallon sized bag. We keep these bags out by our book bundles display so that grown-ups can pick one up as they pick out some book bundles for their children.